Last June, when looking at the most unstable of China's mega conglomerates Anbang Insurance (the others are HNA, China Evergrande and Dalian Wanda), we said that "Anbang's troubles could soon become systemic." Half a year later, that's exactly what happened when in a "surprising" twist, the $315 billion insurer was bailed out by Beijing, just days after we pointed out the tremendous surge in the yield on its bonds. And while the market has so far blissfully ignored the potential consequences of this admission by China that all is not well with its biggest corporations, that may soon change. For starters, there is HNA's massive debt: according to Bloomberg data, HNA Group’s dollar debt dwarfs that of other stressed Asian borrowers such as Noble Group Ltd. and India’s Reliance Communications. S&P Global Ratings recently lowered HNA Group’s credit profile to ccc+ from b earlier this month, saying it is unclear if existing access to capital markets and some apparent bank support is sufficient for meeting its upcoming obligations. One look at the chart above should confirm that any hope HNA may have had of accessing markets is now gone, leaving only the government as a lender of last resort. And while there’s no indication - yet - that HNA is facing such financial difficulties that a default is in the offing, some market participants are starting to game plan scenarios, and a variety of takes have emerged. For one, the amount of dollar bonds outstanding for the conglomerate and its units, at $13.7 billion, accounts for more than 1% of Asian high-yield bonds outside of Japan, and raises the question of the impact on the broader market. While many see little wider impact in the event of a default, the case of China’s most popular, to date, debt default - that of Kaisa Group Holdings three years ago, when Asian dollar junk bond premiums widened considerably - should serve as a warning. “The impact of an HNA default on the wider market would depend on a number of factors. I would expect a knee jerk reaction, mostly isolated to recently (overseas) acquisitive companies"
Finally, here an interesting take from Bloomberg Markets Live commentator, Andrew Cinco, who sees the Anbang blowup as eerily similar to the Japanese bubble peak. I guess the NYC Landmark signal still works. Anbang goes wobbly just a few short years after its splashy purchase of a trophy Manhattan property, the Waldorf-Astoria Hotel. 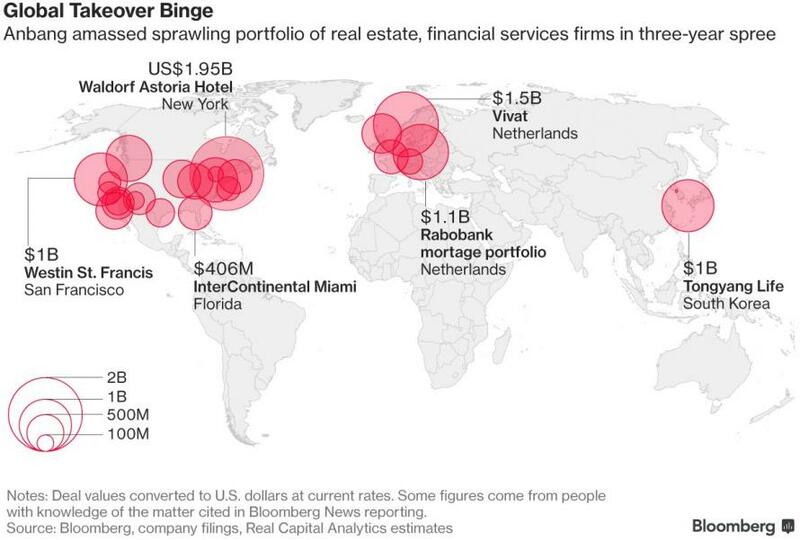 It brings to mind the Japanese real-estate bubble in the late 80s, and one has to wonder whether China will suffer the same retreat eventually. "Mitsubishi's sudden decision to exit Rockefeller Center is the most striking in a string of recent retreats from the trophy properties stretching from New York to Honolulu that Japanese companies acquired during a real estate binge in the 1980s."